Hang Seng is enhancing its digital experience for retail customers through upgrading and expanding the capabilities of its artificial intelligence (AI) chatbot HARO, which will be rolled out in the middle of September. HARO handles general customer enquiries about products and services, assists customers with managing their personal finances via their Personal e-Banking accounts, and is also able to engage in interactive dialogue with customers through the chat interface to assist with personal finances management. 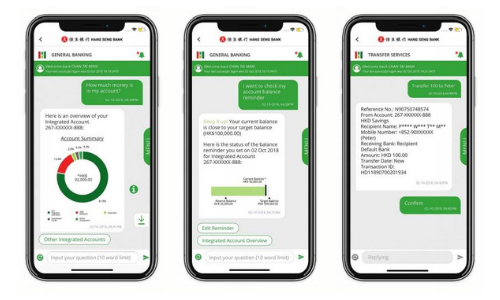 The chatbot’s new abilities will include assisting customers to log into their Personal e-Banking accounts, providing them with an easy-to-read graphical visualisation of their asset allocation in response to integrated account balance enquiries, and helping them set up personalised balance alerts. Available on iPhones and Android mobile phones, HARO will also be able to help customers check their account balance and make small-value, peer-to-peer payment transfers through the same chat interface. “Since introducing Hong Kong’s first retail banking AI chatbots early this year, we have been expanding their service scope to meet the evolving needs of our customers. The rolling out of these latest capabilities will enable HARO to provide customers with more personal assistance in a simpler way,” commented Margaret Kwan, executive director and head of retail banking and wealth management of Hang Seng. Hang Seng is the first bank in Hong Kong to have launched retail banking AI chatbots that can simulate human-like contextual conversations and interact with customers. Developed in collaboration with IBM Services, HARO has been assisting customers through hangseng.com and the Hang Seng Personal Banking mobile app since January 2018. Powered by IBM Watson’s machine learning and natural language processing technologies, HARO can communicate in both Chinese and English, and can also understand Cantonese as well as the mixing of English and Chinese. JWT appoints, Mindef calls pitch plus more. ..
Spotify has taken a different approach for its official debut in the Philippines by partnering with a telco to leverage on the mas..